I have long been a fan of Space Strategy games: Over the years I have played Homeworld (I, II, and Cataclysm), Conquest: Frontier Wars, Starcraft (I and II) and Star Trek: Armada (I and II) — and have completed most of them. For me, the challenge of building a base, creating an economy and an infrastructure, and then turning out a large fleet of battlewagons with which to annihilate the enemy’s base is immensely satisfying. It would be fair to say that Space Strategy is my of my two favorite Genres. It comes a close second to Flight Simulation, but since the latter requires specialized hardware to enjoy, it is the space sims that get the bulk of my screen time. Surprisingly, I did not embrace any of the plethora of online Space Strategy Games that have come out in the past few years, such as Earth and Beyond, Project Entropia or EVE Online, This is partly because of the real-time nature of these games required a time commitment that I was not willing to give, but mostly because of the cost — most of these offerings require a regular subscription of some serious coin. Unsurprisingly, I do not own a Game console, and never have; partly because neither Flight Simulations nor Space Strategy games are popular on those platforms. I had tried a couple of space strategy games for Android Phone and tablet, but found them wanting… until I discovered Vega Conflict last night. 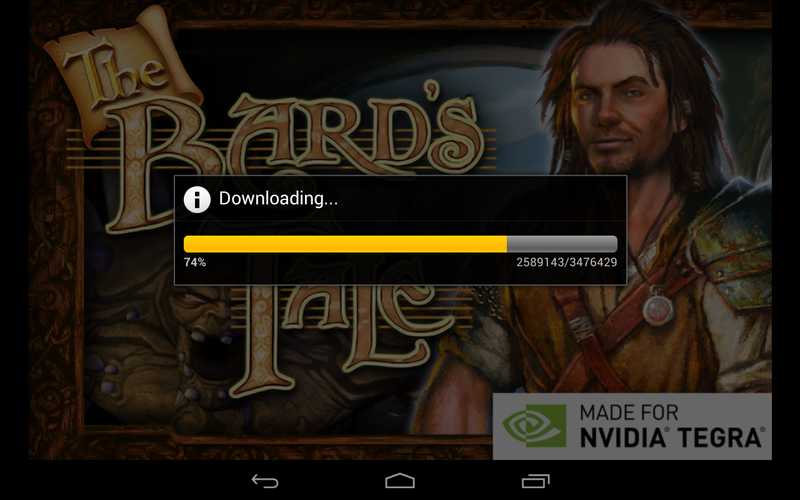 This Android game, created by Kixeye, runs on most modern phones and tablets: if your hardware is less than two years old it should run well, though it does look better on a larger screen like my Second-Generation Nexus 7. It also runs nicely on my two-and-a-half year old Galaxy S3, though the small screen makes the fonts almost impossible for my wizardly eyes to discern. Having said all that, I am seriously enamored with this game. One thing that should be noted is that it requires an Internet connection in order to play. If you try to start the game without one, it gives you an error message and will go no further. If you lose your connection while playing the game, it will drop you. Also, a Social Media connection like FakesBook or Google+ is highly recommended. More on that later. Is it me, or is she wearing a negligee? You start the game with a base installation called “The Bridge”. This is your command center, and the nexus of your operations. This unit can create mining units, tech, ship and arms research labs, ship factories, Fleet Bays and other other support and defence units, which are laid out on the predictable isometric grid that we all know and love. Units can be upgraded at various costs in both materials (which must be harvested) and time (which may be avoided by spending the gold coins). Units can also be moved at will, but unless they are placed close to other units they will not get any power and will cease to function. The tutorials are fairly straightforward, and walk you through the process of getting a base up and running and leaning the basics of combat. However, I found the tutorial on “strafing” to be frustrating in the extreme, and it took at least a dozen attempts before I finally got it right and was able to move onwards. This game is so good that it kept me up until 3am this morning — something that hasn’t happened in many a year. That’s all for now. I’ll post more on this most excellent game… later. Until then, you can find me on Planet 5101. See you there. It would not be entirely unfair to paint me as an Android fanboy. But the word is loaded with negative connotations — perhaps it would be more accurate to say that I am a fan of open standards. While I like Apple products, their “we-know-best” attitude sometimes leaves me less than enthused. This is perhaps the reason that I have been sporting an Android-based phone for over two years — first a Motorola Droid X2, then a Samsung Galaxy S3, both through Verizon, (damn them, but that’s another story). Over those two years I have probably spent over $100 in the Android Market, now known as the “Play Store”, much to my annoyance (the earlier name was far more apt, in my opinion). I love the ecosystem that allows a programmer to create something, sell it for a a dollar or two and still make a fortune. 1: You cannot mix credits and cash. I recently received a credit from a developer as a “Thank-you” for helping to test their game. I was purchasing a $2.99 game and had $2.79 of that credit left. The obvious thing to do would be to use up the credit and charge the remainder to my card… but that is apparently too much to ask – the Play Store’s payment system does not allow “split-payment” purchases. 2: A fifteen-minute refund window is way too short. 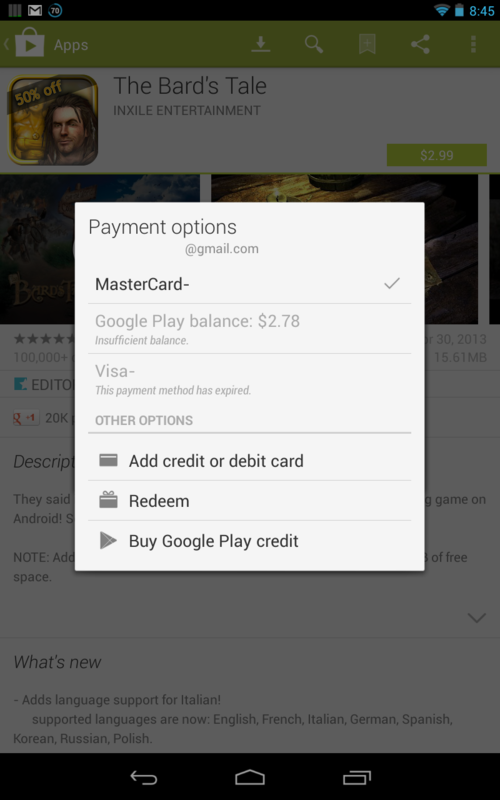 A play store purchase may be refunded within fifteen minutes. This makes sense for a quick-download, short-attention-span game like Quell or Cut the Rope, where a quarter of an hour is ample time to ensure that the program works properly on your device, but this is not the case for some “big” games that use a stub program to download gigabytes of data before the game can be played. By the time the download is complete, the refund windows is long gone. Solution: Let the developer decide on the length of the refund window. 3: You can no longer set an individual app to auto-update. This used to be possible, but with recent updates to the play store, the only option is the global one, which is NOT what I want. 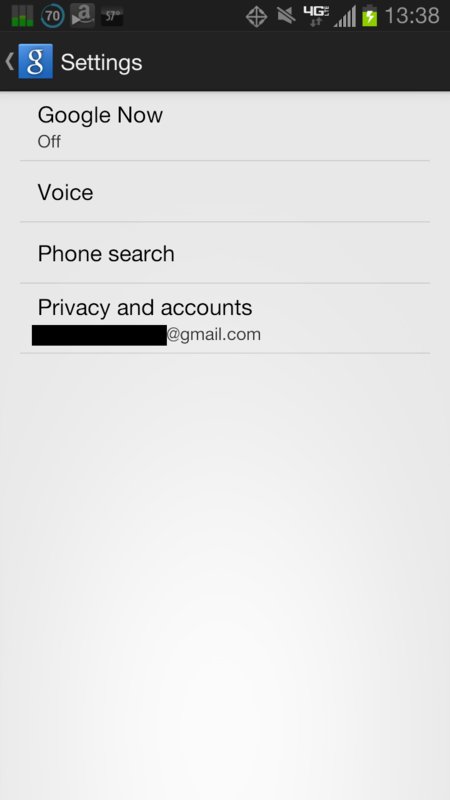 Interestingly, the option is still there on my Nexus 7 tablet, but has disappeared from my phone. 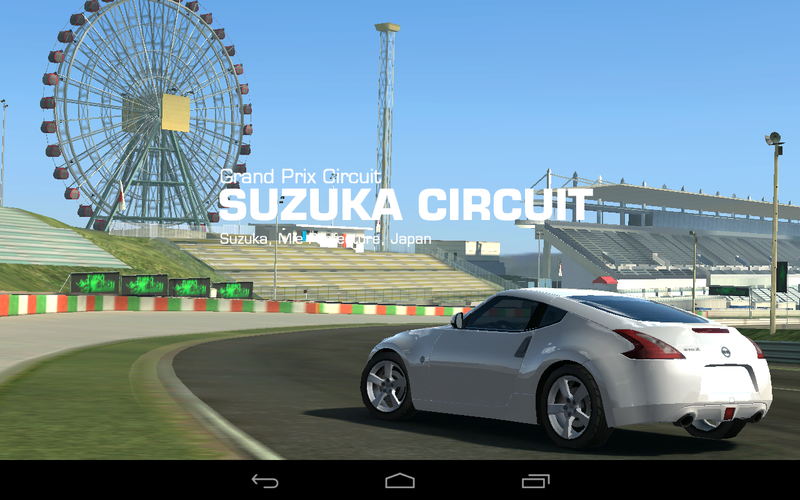 I am not much for racing games. Perhaps it is because most of them are either too realistic (i.e., I keep losing the race!) or not realistic enough, but on the other hand maybe it is simply because I love other genres (Flight Simulations, Space Strategy etc.) more. The last racing game I played — and still play, occasionally — is “Pod Racer”, the Star Wars offering from some years ago (but is that really a racing game?). I have also occasionally dabbled in various flavors of “Need for Speed”, but never really got into it. My introduction to the genre, however, goes all the way back to 1984, when I bought a BBC Model B Microcomputer. I remember the games that I played to death on this thing: Elite (the first “MegaGame” and mother of all Space sims), Phantom Combat (two-player head-to-head!) and Revs. Revs was a Formula Three simulation. Not a game, it was a true simulation modeling the track layout of the Silverstone circuit, complete with bumps and hills — somehow packed into the “massive” 32 kilobytes of memory that was state-of-the-art way back in 1985. Featuring drivers with Pythonesque names like “Miles Behind”, “Max Throttle” and “Gloria Slap”, “Percy Veer”, “Hugh Jengine”, and “Johnny Turbo”, it is safe to say that I was addicted, even if I wasn’t particularly good at it. Cars you have are listed in white. Cars you don’t are in gray. Cars in red are in the shop…. Once loaded, you are presented with the main screen. This shows a collection of series, with the cars that are allowed to compete in each series. You start with enough cash to buy one of two cars – The Ford Focus RS or the Nissan Silvia (S15). 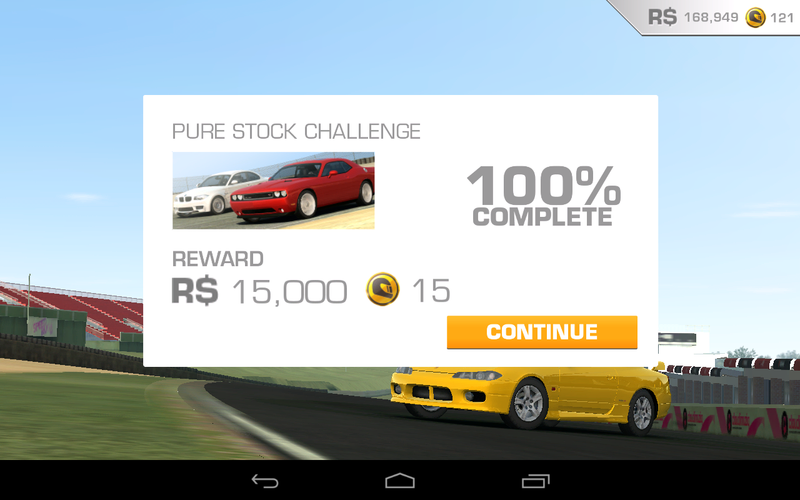 You then race that car in a series (such as “Pure Stock Challenge”). Each series consists of over thirty races arranged as a series of “tiers” (usually fourteen). Each tier consists of one, two or three races. Most series have a list of cars (usually four) that can race in it. Completing a race in the first three places gets you a trophy. Completing a tier unlocks a later tier, and gets you a bonus of gold coins. 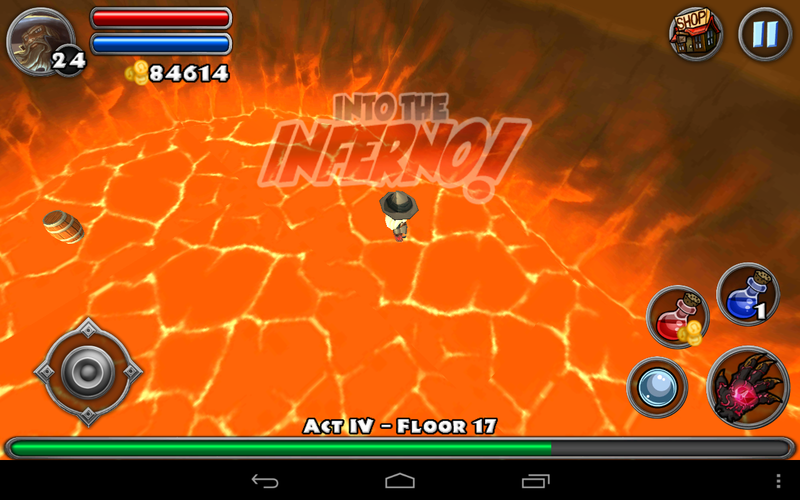 You also get bonus coins and R$ for completing 25%, 50% and 75% of a series, with a big bonus at 100%. Each series contains one “Showcase” race for each of the cars that can compete in that series. Unlocking a Showcase for a car you do not yet own gives you a one-off opportunity to buy that car at 20% off. 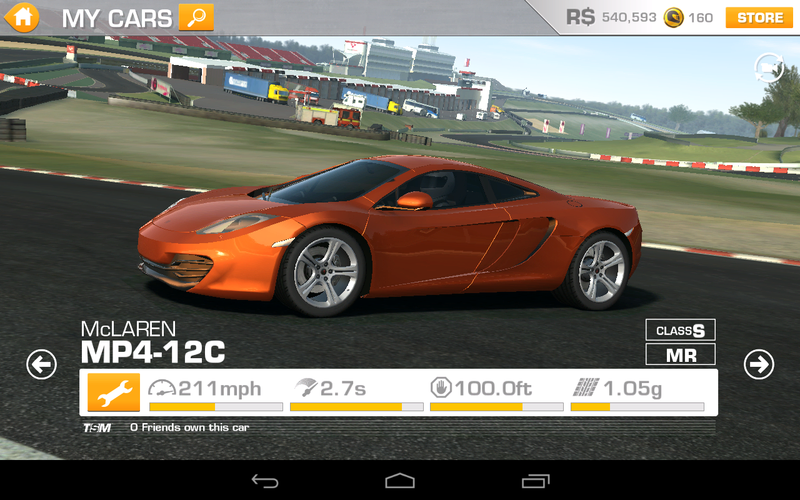 Drag Race: No steering, no braking, just gear changes — just change gears each time the rev counter hits the red-line. The first couple of times it will be confusing, but once you get the hang of this it is easy. 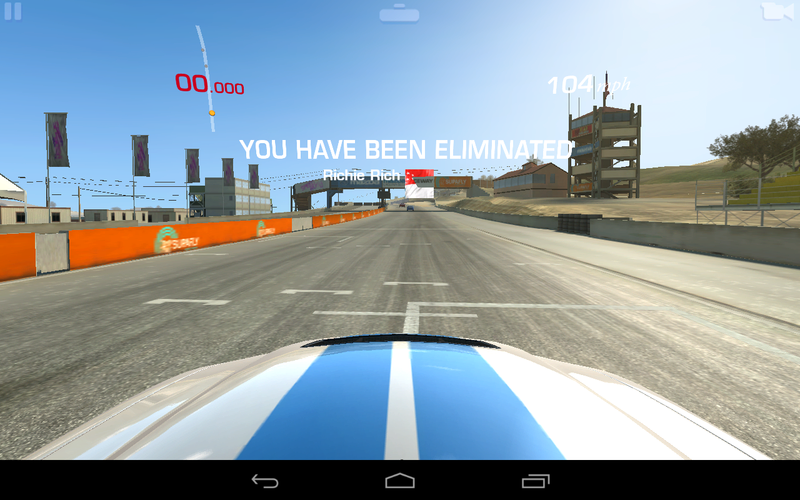 Speed Record: Get the highest speed that you can in one complete lap. Head To Head: One opponent, one lap, one objective – win. So why does the game show the cars side-by-side and then gives opponent a head start? Speed Snap. You start a short distance from the finish line. Your job is to cross it going as fast as possible. Endurance: You begin with sixty seconds on the clock and a track full of cars. Passing a car gives you ten seconds. Completing a lap gives you a time bonus. Drive as far as you can before you run out of time. Autocross: You are timed along a section of track. Shortest time wins. Hunter: Catch and pass the hunted car, who starts with a head start. The distance between you at the end of the lap is what counts – greatest distance wins. Cup: The commonest, and in my opinion, the most of irksome of all the race types. You start the race at the back of a pack of twenty-two cars (sixteen for a showcase). To win, you must fight your way to the front. This is either really fun or really frustrating, depending on your car and the track… and whether or not you are out in front. Indianapolis Speedway: Go fast, turn left. Lather, rinse and repeat. The fastest and easiest track in the game, and the best to practice basic handling. Mount Panorama: Up the mountain, down the mountain. Some interesting bends and a bee-yootiful long downhill straight that never fails to put a smile on my face. Silverstone: Ah, what memories. The home of British Formula One racing, with wide, sweeping curves and some luvverly straights. Three different tracks, all a pleasure to drive. Brands Hatch: A short track with lots of bends to test your cornering and one half-way decent straight. Hockenheim: And then there’s the Germans. A technical, challenging track, with more bends than… a very bendy thing. Another venue with different tracks. Melbourne: The track I love to hate. A downtown street course with lots of turns and switchbacks. Lots of fun — I particularly like putting an opponent into one of the barriers, but one mistake can send *you* into the barriers and cost you the lead, if not the race. There are two forms of currency in the game: Cash (R$), and Gold. 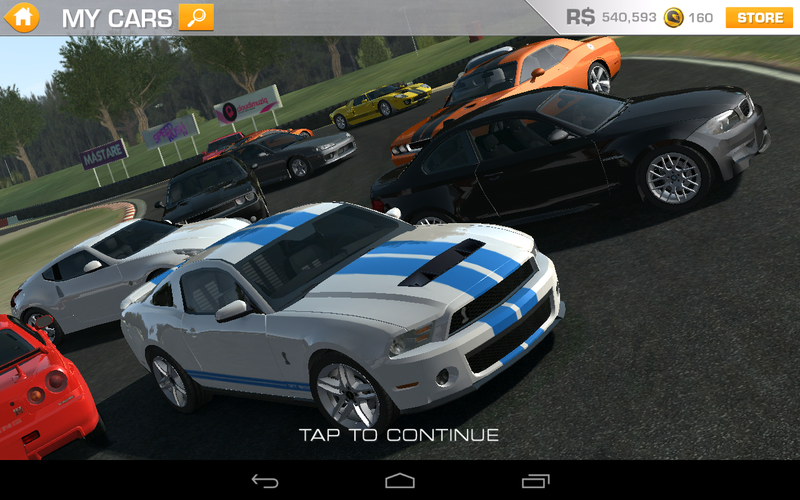 You get cash for completing a race, and you spend it repairing and upgrading your cars, or buying new ones. Prices of cars range from R$28,800 for a Nissan Silvia (S15) to a whopping R$2,210,500 for the Koenigsegg Agera R.
Gold coins are given for completing tiers and series, and gold can be spent in three ways: First, some cars can only be purchased for gold: the McLaren MP4-12C is a bargain at a mere 65 Gold — a real poor-man’s supercar. Second, some upgrades can only be purchased for gold. But the commonest use for gold is to use it shorten the wait times for maintenance and upgrades — the longer the delay, the more gold coins are required. I consider this to be a waste of coins — I have never done it (except once, when I hit the button by accident). Other reviews have bitterly derided the freemium model in general and this particular implementation of it in particular, but I think they are being unfair. Think of it as a tax on impatience: if you have multiple cars, it is a simple thing to jump into another car and race it while the work is being done. And if you have only one car, you will have to learn a little patience until you buy a second car (you’ll be buying one anyway). Some maintenance can be delayed for a while, and if you time it right you can queue up a bunch of maintenance items at bedtime. As I mentioned earlier, I have not paid a dime to play this game, and at the time of writing I have thirteen cars and over three quarters of a million dollars in the bank. So quit whining already! Assists: Driving a high-performance racing car is far from easy. The cars are twitchy and temperamental, and so are some of their drivers. Fortunately the game provides some relief in the forms of Steering Assistance, Braking Assistance and Traction Control. With all assists on, the car is docile and predictable, with few skids and little drama. Turn the assists off, though and you get much better performance, at the expense of a lot more work. You have to be intimately familiar with every bend of the track, entry, acceleration and exit points, and the best racing lines if you want to bring home the medals — and your car — in one piece. The graphics are, to put it bluntly, lovely. The road detail is enough to give a sense of “ground rush” when traveling at high speed. Cut a corner, and you will see your tire marks at that spot the next time you pass by.Your car rocks and rolls during extreme maneuvering. Each car sounds, feels and handles differently, and after driving a car for a while you get a feel for when the tyres are about to lose their grip. I can’t see how they could possibly improve in this department. The game’s most-touted feature — “Time-Shifted Multiplayer” is, im my opinion, it’s Achilles’ Heel. The idea is sound enough; model the real-world performance of real-world players so you can compete against your friends. The problem is that you end up competing against experts who are well-nigh-unbeatable. These are folks who are extremely good at the game and drive with all assists off – and presumably have way too much time on their hands, and. This makes for an inherently unfair race without some kind of handicapping system. Fortunately there is a solution — play the game with network access switched off. This forces the game to load the default robodrivers. More about that later. The driver modelling is one of the few area that needs improvement. Some of the cars are occasionally impossibly fast. 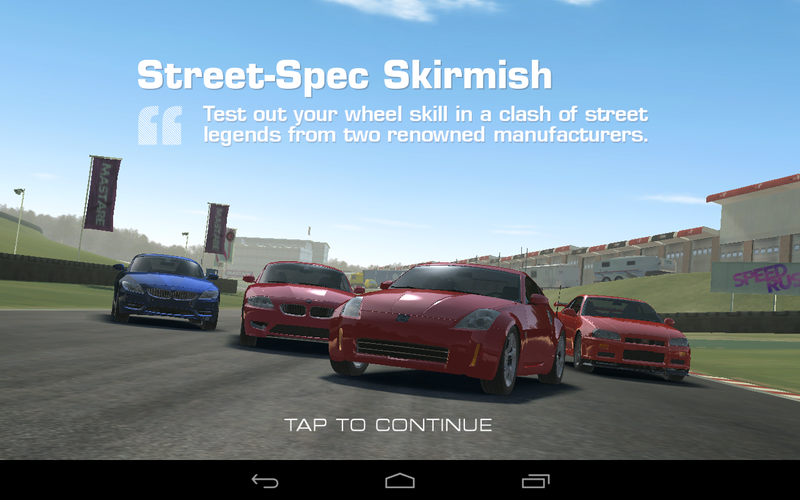 For instance, you are driving a fully-upgraded car down a straight. Next to you is another model of the same car… and he is pulling away from you. I call this “what-the-hell-is-he-driving?” syndrome. Fortunately it does not happen often, and the “enemy” will usually slow down enough at the next corner for you to catch up, but this tells me that the driver models need tweaking. It is a minor nit; re-doing the same race is often enough to get you into the winner’s circle. Repairs, Maintenance and Upgrades — Oh My! At the end of each race, you will have the opportunity to repair, maintain and upgrade your vehicle. Repairs are cheap and immediate, and should always be done. Maintenance (Oil Changes, Tyre Replacements, suspension work, Engine Rebuilds and Brakes) should also be done when their performance starts to deteriorate, but these take time, depending on the amount of work required. This can range from two minutes for an oil change on a low-end car to hours for an engine rebuild on a supercar. When you only have one car, this can be a pain… but when you have a bunch of cars in your garage, you can simply hop in another one and go racing while the mechanics do their thing with the magic spanners. Because of the delay in performing maintenance, you may wish to delay it under certain circumstances. If, for instance, there is a minor penalty to cornering and you are about to race on a track where cornering ability is not that important (like the Indianapolis Speedway), you might want to put it off. Or you might want to leave it until you can do several maintenance items at once. I have one bone to pick with the developers: Why in the name of all that it is holy did you insist on FaceBook as the *sole* vehicle for the social aspect of the game? I can only assume that FaceBook must have offered Electronic Arts a big pile of money to make FaceBook the *only* option for multiplayer. I would love to play this game against some real people, but creating a FaceBook account just to play a game is something I will not do. Too many similar cars! For instance, BMW has the 1 Series M Coupe (R$59,800), the Z4 M Coupe (R$62,900), the M3 Coupe (R$84,600), Z4 Sdrive35is (R$89,700), M3 GTS (R$118,700), M6 Coupe (R$ 127,700), Z4 GT3 (R$457,000) and M3 GT2 Alms (R$654,000). Porsche, with the 911 GT3 RS (R$172,700), 911 GT3 RS 4.0 (R$185950), 911 GT3 Cup (R$265,500), Carrera GT (R$449,800), 918 RSR Concept (G150) and 918 Spyder Concept (R$845,000) are similar offenders. This is why it is so important to know which cars you need, and which ones are just “Red Herrings” put in my the developers to get you to waste your money. Driver models need tweaking. If you rear-end somebody, they take off and you slow down. But if they rear-end you, you slow down. And they pass you. Not clever. Too many temptations to spend money on stuff you don’t need. This may be intentional. No Track Layout, Maps, Practice laps, or guides to maximum speeds. No qualifying laps — you always start in last place. Some don’t like “Freemium”, but it doesn’t bother me. I have not enjoyed a racing game this much in more than two decades. It is beautifully designed and horribly addictive. 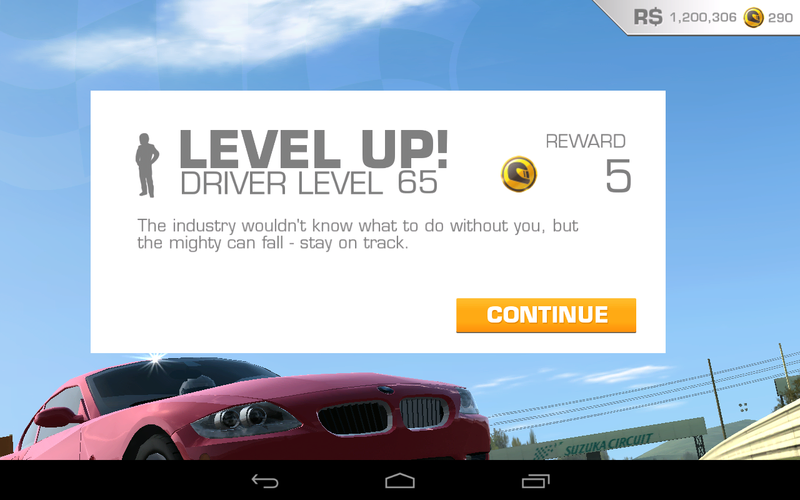 Unlike most racing games, it also teaches some life skills, such as patience (maintenance takes time, upgrades take more time and buying a car takes still more time to have it delivered) and budgeting (if you are impatient, you will run out of money real fast, at which point the game becomes a grind). The key to prosperity is thinking ahead and delaying immediate gratification; play your cards right and you should be able to buy every car (except your first) at a discount. The premise is simple enough; run your character — a wizard, no less — through each level, killing baddies, breaking barrels, opening chests and generally grabbing everything that isn’t nailed down, in a bid to improve your weapons, experience and bank balance. The game is divided into “Acts” Each act consists of five levels and a Big Bad Boss to kill to progress to the next one. Any In-App-Purchase will remove the annoying but necessary advertising — so you can get rid of the ads for as little as a dollar. It is easy to get lots of gold — just repeat some of the earlier, easier levels. While it is perfectly to complete the game without spending any real-world money, it is not at all necessary. The control mechanism needs a little fine-tuning; hitting some enemies is difficult if you are using a straight-line weapon. Using a scatter-shot or a seeking weapon helps. 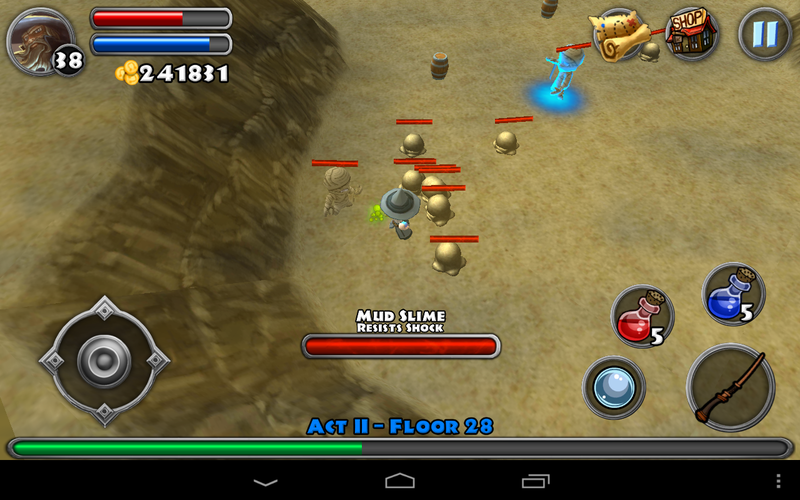 On a similar note, It is sometimes difficult to face an enemy without moving toward them. This could be fixed by adding a “dead zone” to the controls. Picking up mana or health orbs if the relevant stat is already full does nothing. It just disappears. This seems kind of pointless; the excess mana or health could and should be channeled into making more potions. Sometimes loot gets thrown “over the wall” beyond your reach. This will probably be fixed soon, but you should be aware of it. Having said that, the game is still in beta, and is still in development. There have been several upgrades to the game in the time I have been playing it — indeed, on one occasion, the game updated itself while I was playing it, kicking me out of the game. The developers cannot do anything about this behavior, which is handled by Android — but it can be avoided easily enough by turning off auto-update feature. Those are minor gripes, though, and detract little from what is truly a lovely game — and a great excuse to buy a Nexus 7. Within the next month, there will be another major upgrade, and the introduction of the Warrior character. The bottom line: A beta it may be, but it is one of the most polished betas I have ever seen. Yes, it could be perfect, yes it could be better, but what do you expect for free? At the end of my recent piece on Jelly Bean, I mentioned a few annoyances. The app drawer scrolls horizontally instead of vertically. 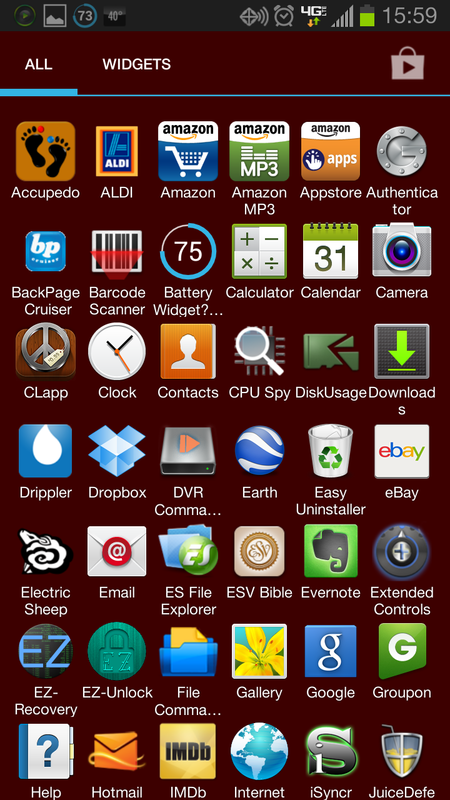 My earlier phone – a Droid X2 – had a vertically-scrolling app drawer; I personally found this far easier to navigate than jumping from page to page. When you plug your phone in to charge, the screen lights up for no good reason. This is not necessary and is sometimes a distraction – the indicator light is all the feedback I need. Widgets stop responding. 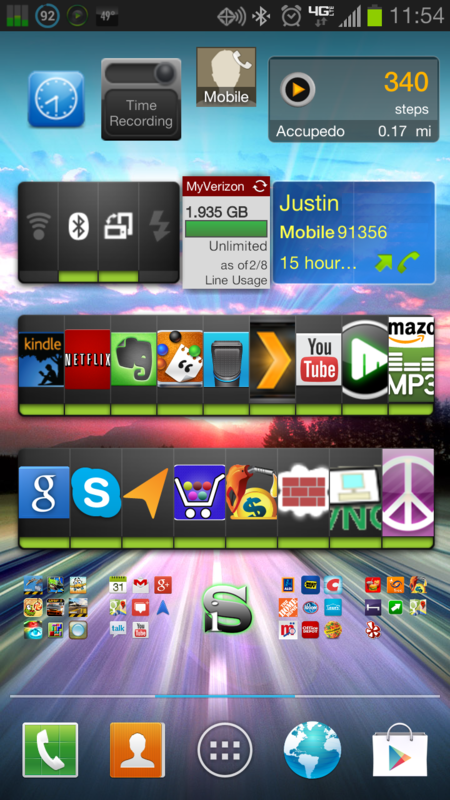 My central home screen is almost entirely widgets. However, they often do not update For instance, the Accupedo widget in the top right “freezes” until the phone is rebooted. While Googling to find a solution to the first problem, I stumbled across a couple of launchers, called NovaLaunch and Holo Launcher HD. For those who don’t know, a “Launcher” in Android is the Front-End program that runs the GUI (like “Explorer” in Windows, “Finder” in Mac OSX, or Gnome/KDE in Linux). While Android has a stock launcher that works just fine, most carriers and manufacturers feel the need to “brand” their phones by putting in a custom “skin” – Motorola’s is called “Blur”, HTC’s is called “Sense”. Samsung’s is called “TouchWiz” . , but I have been able to comfortably bump this up to 6×7=42 — more than double the number of icons without sacrificing usability. Similarly I have increased the main screen from 4×4 to 5×5, and cut the total number of screens I use to only three, another improvement in usability. So what’s the verdict? Both launchers are excellent, but Holo-Launcher gets the slight edge as it makes the home screen rotatable. No widget freezes at all. After a week or so of testing out the two launchers, I uninstalled Nova Launcher and made Holo Launcher my default, then I paid a few dollars for the full version; not because I needed the extra functionality, but because I wanted to support the developers on a small way. 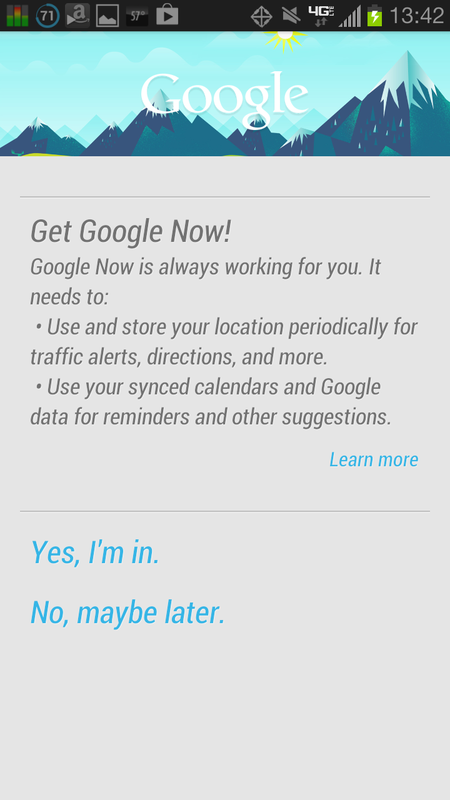 When I upgraded my phone to Jellybean, I was presented with a new feature – “Google Now” (GN). Lacking the time to explore this, I left it switched off for the time being. A few days ago I decided to turn this feature on, as it looked useful. Since then I noticed that battery life was poor and the phone was routinely getting hot. The last straw was last night, when it went from about 70% to 14% in about three hours during which it was not being used. Uninstalling those apps that I had added over the past few days did not help. It appeared that a process called “System Storage” was causing the problem – but why? I did a little Googling and found that one of the culprits was Google Now. “Simple”. I said to myself. “I’ll just turn it off”. The setting is deeply buried. 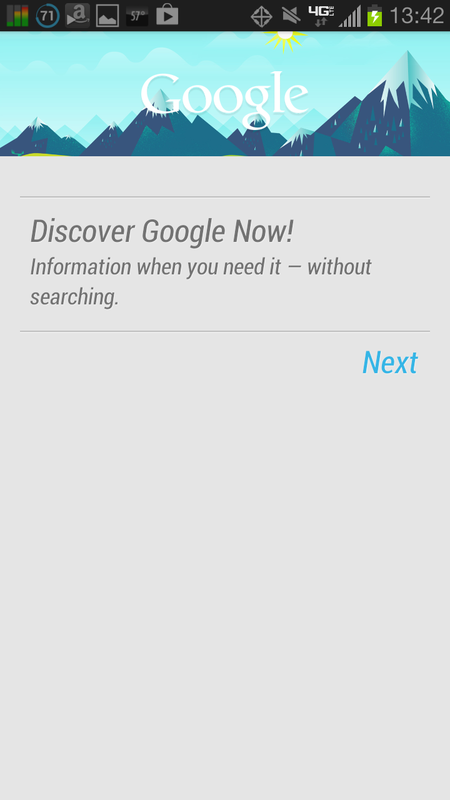 Open the Google Search App, then hit the “Menu” key and open “Settings”, then “Google Now” and simply turn it off!. and then hit “No, maybe Later”. So far so good. Problem Solved :). Note that “Privacy and accounts” has now been changed to “Privacy & accounts”, showing that we are running a different version. One warning: don’t re-enable GN unless you really want to, as you can’t turn it off again without repeating the process. At least until Google fixes this problem. 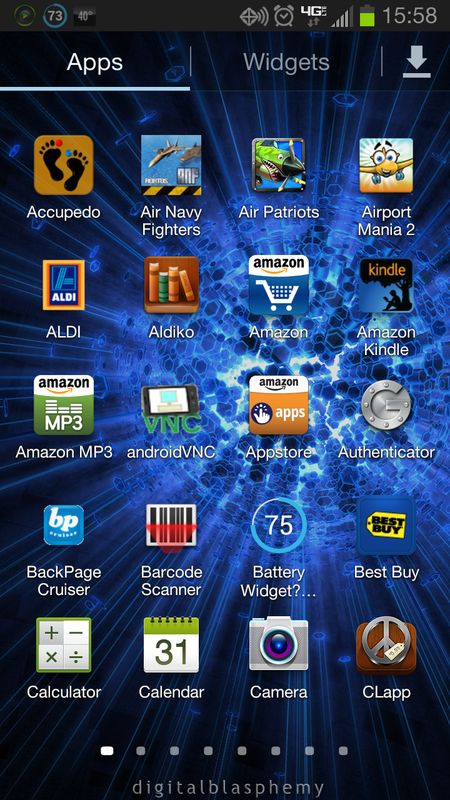 I recently upgraded my Galaxy SIII from Android 4.0.4 (“Ice Cream Sandwich”) to Android 4.1.1 (“Jelly Bean”) a week ago. For me, the problem was a little more complicated than it is for most, as I was trying to keep my phone rooted, while my cellphone carrier was trying their best to break root. It took some reading and research, but naturally I triumphed. A week later, I am able to report on the story so far. Immediately after the upgrade, things ran slowly, but within a day or so they settled down nicely. I use Battery Widget Reborn to track battery usage, and JB is definitely more power-efficient than ICS; I get 10-12 minutes of up-time per 1% of battery life – about double that of ICS. What this means is that I have about 45-50% of battery left at the end of a typical workday, while under JB it was more like 15-20%. Another result of the upgrade was Google’s much-ballyhooed “Project Butter”, an initiative to make the User Interface (“UI”) smoother. I was skeptical, but I have to admit that JB does, in fact feel smoother than its predecessor. The final area in which I noticed a massive improvement was in stability. My previous phone (a Droid X2 Running 2.2 Froyo then 2.3 Gingerbread) was notoriously unstable, requiring two or three reboots daily. In addition it had an annoying habit of spontaneously rebooting, particularly when GPS was playing up. Nothing as annoying as suddenly losing GPS navigation on a strange road on a dark night. 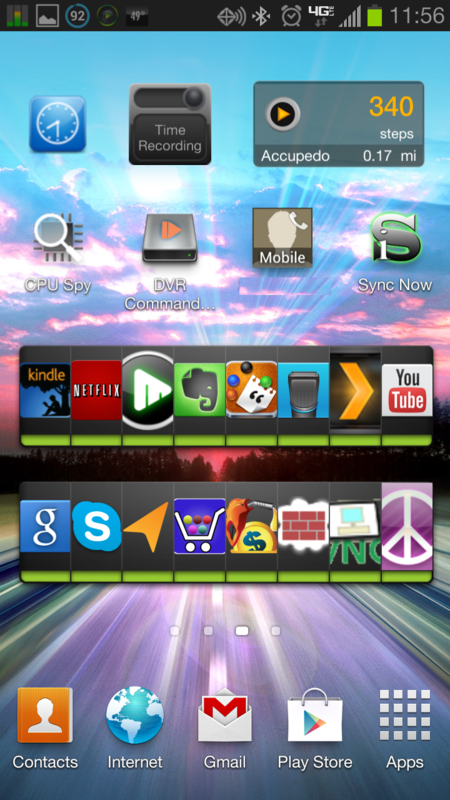 ICS on the SIII was a massive improvement, but even so I found myself rebooting daily. But JB takes stability to the next level; there is simply no reason to reboot. If you want proof, check out the screen shot. More than eleven and a half days of up-time without a reboot. Yes folks, Android is now officially more stable than Windows. There are a few things that Jelly Bean is missing, in my opinion, but they are minor cosmetic issues. I would rather have a fast, stable, secure operating system than one that just looks pretty (I’m looking at you, Microsoft). But that list – along with my solution – is another story for another time. As anyone familiar with this blog knows, I have a Samsung Galaxy S3. And is it rooted. Before that, I had a Motorola Droid X2. And it was rooted. I don’t make a big deal of it; I know that most people neither know nor care about rooting. However, sometimes it comes up in conversation, so I thought I would explain rooting and some if the commonest questions here. 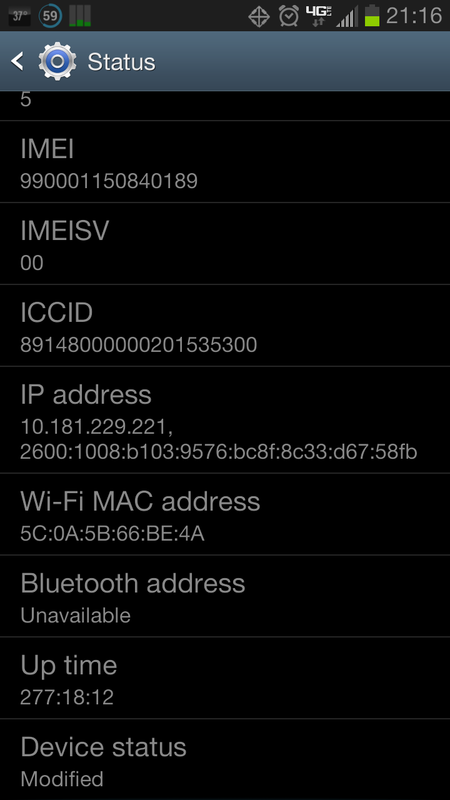 Rooting is enabling “Root Access” to the system areas of your phone’s operating system. It is the equivalent of running as “Administrator” in Windows. Is Rooting the same as Jailbreaking? Not exactly. While Jailbreaking may include rooting, it also includes altering your iDevice so that you can get your apps from sources other than Apple’s App Store. Apple do not want you to do this. Unlike Apple, Google have no problem with this: while Android devices are locked to The Android Market (I still cannot bring myself to call it the “Play Store” with a straight face), clearing a checkbox in your device settings (usually under “Developer Options”) will allow loading of apps from other sources (such as Amazon’s Appstore). Only if you’re stupid. There is much talk about the potential for malware on a rooted system, as a badly-behaved app can do far more damage to a rooted system, but only if that app is explicitly granted root access. Unlike Windows Programs or Apple apps, every Android application has to specify what permissions it requires when you install it. A visual inspection is enough to identify any funny business — like a game that requires the ability to make calls, for instance — and you have the opportunity to refuse to install it. And while you can configure apps to update automatically, if permissions change you have to manually upgrade. If an app tries to access functions that it isn’t supposed to have, Android will shut it down, and in exceptional cases, Google can remotely remove misbehaving apps. Also bear in mind that not every program needs root access — programs that want root access have to request it from you; you can grant it on a one-time or permanent basis. The bottom like is that as long as you are paying attention and thinking about what you are doing, you are fine. There is a small but distinct possibility that a botched attempt at rooting your phone will “brick” it, leaving you with an unusable phone and a hefty bill for its replacement. But that usually has more to do with your hardware supplier’s efforts to prevent you from rooting than with the rooting process itself. But there are plenty of resources out there to help you root with confidence — if you are skilled enough to install Windows on a PC’s Hard Drive, you probably have the necessary skills to root your device. Doesn’t rooting void the warranty? In theory, yes. In practice, “don’t ask, don’t tell”. Phone companies ted to discourage users from rooting, and they often trot out the “warranty void” line to scare users away. But most devices can be returned to “stock” (out the box, unrooted) configuration just as easily as they were rooted in the first place. So if you have to take your phone in for warranty service, simply return it to stock, and it will be difficult — if not impossible — for them to tell that it was ever rooted. This is as it should be. In my opinion, rooting should not be a good reason to deny warranty coverage unless it was the rooting that caused the problem. So why doesn’t my phone carrier/supplier want me to root? In a word, money. Rooting diminishes your Carrier’s control – and profitability. So carriers will have a tendency to steer you toward purchasing their products and services over the (invariably better and often free) competition. Locking down the phone is an effective way to do this. At the time of writing, my carrier just rolled out a system upgrade that fixes a few minor bug, adds a few “shovelware” features I neither need nor want, removed Google’s “universal search”… and adds a “Google Security Patch” that just happens to break root. Thanks but no thanks. Backups! Titanium Backup can backup and restore your apps and data/ This comes in useful if a new version of an app does not work on your phone and you have to roll back to an earlier version. you can backup and restore individual apps and their data. This is particularly useful if you are moving a game to another phone and want to keep your settings and high score. As far as I can tell, the Android Mark… er… play store cannot do this. Remove Camera Click: There are times that you may want to take a candid shot without your camera making a loud “Click!” to alert them of the fact. Phone companies will not generally allow this feature, but once your phone is rooted it is easy. Remove bloatware/shovelware/crapware. My carrier (Verizon) loves to bundle “useful” (i.e. profitable) apps, such as VZ Navigator, Blockbuster, Slacker or City ID, to name but a few) into the phone that cannot be removed (left in place but rendered inoperative) or uninstalled… unless, of course, you have rooted your phone. Replace that garish vomit-and-epileptic-fit-inducing Verizon LTE boot animation with something a little more stylish (i.e., anything else). There are many other reasons too root, but these are mine. As you can see, none of them represent criminal behavior, nefarious purposes or a clear and present danger to National Security. Those who came to this post expecting a tell-all of a romantic tryst in Paris will be sadly disappointed. 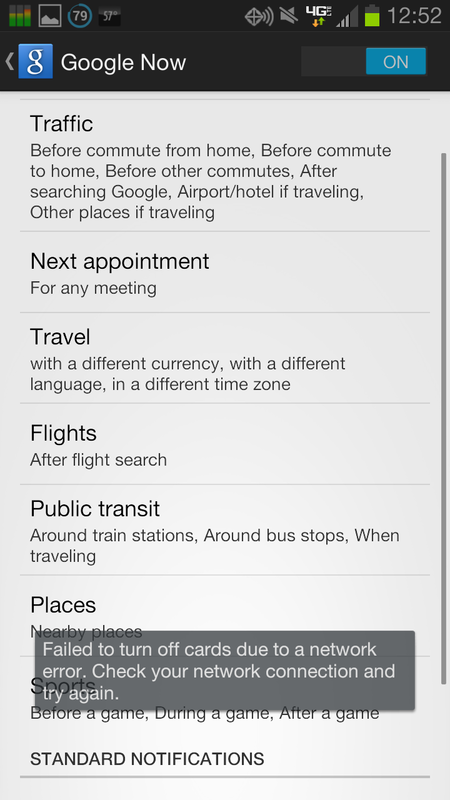 EVA stands for “Extreme Virtual Assistant”, and is a program for Android Phones. A smartphone is more than a phone, it is a convergence of technologies: GPS, Internet, Music, Video, Camera, E-mail, voice. Your smartphone knows where you are, which way you are facing, how fast you are moving and where you’ve been. One result of that convergence is the ability to give your phone instructions using voice commands. I have long predicted that it is only a matter of time before we are talking to our phones as if they were people, a la Star Trek. My experience with speech recognition dates back to the last century (! ), when I experimented with IBM’s ViaVoice software. It required a lot of “training” to get accurate results. My (British) accent was always a problem with the U.S. version of the software, and the British version used British spellings, which was a problem as I lived in the U.S. at the time. Corrections were too cumbersome and I eventually abandoned the effort. Both then and now, the main problem with speech recognition is that it requires a lot of processing horsepower – more than a typical home PC. Smartphones get around this problem quite elegantly by uploading the voice data to servers in the cloud which can then pound on it and return the text results to the phone in a few seconds. The downside is that voice recognition will not function at all if your phone loses Internet connectivity. I stumbled across EVA a week ago. Since them I have been plumbing her depths (oo-er) and finding out what she can do. 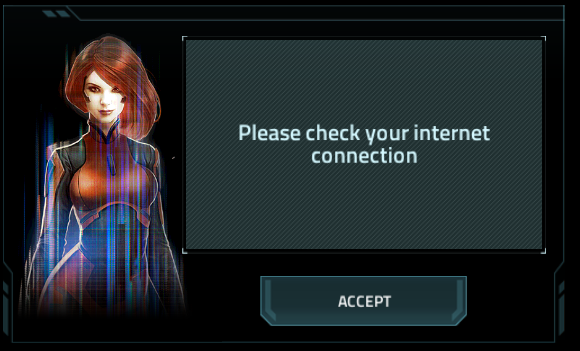 Yes, EVA is female, and has an attractive female avatar (which I can – and have – turned off). There is also a male version called EVAN, for those who are that way inclined. EVA essentially operates in one of two modes: “Wake-up mode” is a sort of Standby mode on which the programs waits in the background, listening for her name. You can get her to perform one command by prefixing it with her name (“EVA turn Bluetooth on”), or you can just call her by name to switch her into the second mode, in which she is in the foreground listening for commands. Oh, and to avoid accidentally waking her up, I changed her name to “Victoria”. Create reminders, such as: “Remind me to talk a walk at 2:45”. For those who need to be reminded about stuff, this feature alone is worth the price of admission. Location based reminders: “When I get home, turn off Bluetooth”. Way cool. The GPS sensing is not as tight as I would like it (due to power consumption considerations). but it works well enough. Dictate text messages and have incoming messages read aloud to you. To get SIRI, you have to buy a new iPhone. EVA costs $10 in the Android Market (recently renamed to the stupid and misleading “Google Play Store”), along with a 28-day free trial for those who want to try her out as an “Intern” (oo-er). Perhaps the most amazing thing about this piece of software is that it is the brainchild of one man – Peter Muller. He has spent over a year building and improving this thing and, as a programmer, I must say that I am very impressed. My only criticism of this product is not really a criticism at all. Because of EVA’s complexity and flexibility it is difficult to keep track of everything. At first glance the settings are bewilderingly complicated, though each and every setting serves a definite purpose. Many of the negative comments that I have seen are as a result of people who did not know how to do something, couldn’t find the information that they needed, and assumed that it could not be done. Peter has created voluminous documentation and a raft of excellent YouTube Videos, but even they cannot cover everything. In my opinion, this product badly needs a Wiki – Peter can only do so much, and with a little community support the documentation could become much more intuitive. Peter has obviously been working his arse off on this. 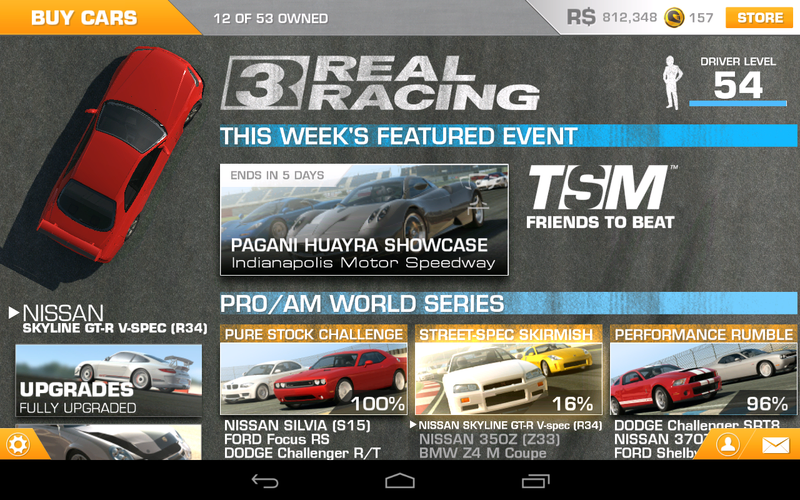 I’ve never spent $10 on an Android app, but will almost certainly make an exception in this case. In previous posts I have chronicled my search for a work clocking app, and of the four contenders that I have chosen. The time has come to eliminate three from the running. I decided to choose the best by a process of elimination; I would use all four and remove the one I liked least. The winner would be the last man standing. So… for several weeks I have been clocking-in and out on four different apps. This means clocking-in four times on entering the building, and clocking-out four times when I leave. This is not as inconvenient as it sounds, since they all have widgets that I have grouped together on one screen, so the entire process takes about seven seconds. The first to go was My Work Clock. This was the most visually beautiful of the four, and had the best interface, but the problems with the widget not updating or not working were enough to remove it from the running. This is a shame, as I really liked this app. Perhaps the biggest problem, though was that it was not possible to edit a clock-in time while you were clocked-in — you had to clock out first. The next to to be defenestrated was Clock Card. I actually paid for this app, and the money wasn’t wasted. Unlike the vast majority of apps I tested, the author actively supported his creation. The third — and the runner-up — was Hours Bank. The reason was simple; the author went out of his way to make himself difficult to contact, and his website was sparse to the point of uselessness. Shame, as the app was very elegant. This leaves Time Recording as the last man standing — and the winner. This program has no fewer than three different widgets that show current status. I nearly dropped this program from my shortlist, as the widgets did not seem work as I would expect — selecting one simply invoked the program. Then I read the manual (always a good idea), and there, tucked away in a sub-menu of an obscure tab in the preferences menu, was a “widget click action” setting that allowed the widgets to work in the way that I wanted. This should have been the default behavior. The author was also very helpful in telling me how to open up the database file so that I could merge old data.